This year’s celebration highlighted the country’s legacy of strong leaders that have brought the autism advocacy forward -- for the last 30 years, across 97 chapters, with 13,000 members -- and have become the foundation on which the next generation of leaders will build the future. “Although many are aware of autism, very few people actually understand what it means to live life on the autism spectrum. SM Cares and ASP come together as a community to remind everyone that autism awareness and acceptance should be part of their everyday lives. Awareness is a good thing, but acceptance is far more meaningful,” said Engr. Bien Mateo, SVP of SM Supermalls and Program Director of SM Cares Program on PWD’s. The pre-walk program was led by Ms. Dang Koe, ASP Chair Emeritus and the inaugural ASEAN Prize Laureate 2018. The ASEAN Prize aims to recognise inspiring achievements and contributions that foster the ASEAN identity, promote the ASEAN spirit, and champion the ASEAN way. ASP is among the active movers behind the ASEAN Autism Network and the ASEAN Mapping Project. Circle, composed of adults with autism. Over 20,000 participants -- families, professionals, supporters from the government and private sectors, from the Philippines and overseas -- joined the annual walk from the MOA Arena to the SM MOA Music Hall. 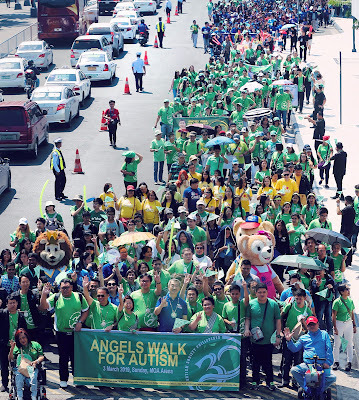 The walk is held with the support of the MOA Arena, SM Mall of Asia, National Council of Disability Affairs, ASEAN Autism Network and the Asia-Pacific Development Center on Disability. The Autism Society Philippines (ASP) is a national, non-profit organization working towards an environment that empowers persons with autism spectrum disorder to become the best of their potentials -- self-reliant, productive and socially-accepted members of the community. ASP labors to establish institutional mechanisms to support persons with autism and their families. Established in 1989, the organization -- composed of 13,000 members spread over 96 chapters -- has been in the forefront of providing services to families and individuals affected with autism. SM Cares is the Corporate Social Responsibility arm of SM Prime Holdings, Inc. Its advocacies include Programs on Persons with Disabilities, Children and Youth, Women and Breastfeeding Mothers, Environment Sustainability, Senior Citizens, and Overseas Filipino Workers (SM Global Pinoy). As a responsible integrated property developer, SM ensures that its CSR programs serve as a catalyst for positive change in the communities that it supports.